The conventional rituals of traditional funeral services are bring acceptance, closure and healing from when a loved one is lost. Families turn to the funeral home to help them plan these important rituals because they find comfort in services we provide, and confidence in our ability to take care of the details properly and completely in their time of bereavement. When you choose traditional burial, there are decisions that speak to family tradition. These may include a memorial service, family gathering, services at the gravesite, and many others. 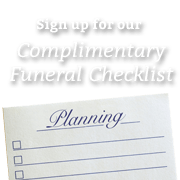 We enhance your service by personalizing the funeral. We look for ways to recall old memories, create comfortable new ones, and make the tribute meaningful. Our services help your family’s healing process to begin. As we listen carefully to your thoughts and desires, and we operate according to your budget. We define and assist your selection from the many forms of tribute or memorial according to the funeral traditions you embrace. We welcome your questions and inquiries at any time. The visitation allows the family an opportunity to view their loved one. This enables people to see and acknowledge the reality that death is, and to acknowledge their loss. This is the first step to accepting death and beginning the healing process. The visitation is also a time when the friends and family have an opportunity to share their memories involving the departed loved one. This part of the ritual is so important to both the family and the community because it allows for or enables people to openly confront their loss in the presence of others. In this way, we share the experience and lean on one another to make sense and accept the loss. The funeral home enables your family to grieve, and to celebrate the life of your loved one with the community. The visitation rite also provides a time to grieve and express your thoughts and emotions. It is the beginning of the healing that must follow loss. The service is a time to affirm the life well-lived. It is when we begin to memorialize your loved one, or to pay tribute to the person. Services provide a time for religious rituals, spiritual acknowledgement, and recognition of the passing of life. The service is the ritual for the loved one – something your family does for that person. We have honored the departed by offering thoughts and prayers. We eulogize our family member and friend. The final rite is the committal service. The committal service, whether you choose entombment, burial or cremation, is a symbolic demonstration that a life has ended. When you commit a body to final interment, it is a realistic and traumatic final goodbye. It is at this time that we must say our last goodbye and turn to the future. The committal rite should be shared freely by family and friends.